Tubi Acciaio Lombarda (TAL) Holland BV is a global supplier of steel piping, fittings and flanges. The company’s account-oriented approach, certified quality system, technical knowledge and personnel skillset guarantees an efficient and cost-effective response to the client’s needs. Increasing customer demand has led to a steady expansion of the TAL portfolio and its storage areas. Available materials comply with an array of international standards, such as the American Society of Testing and Materials (ASTM), American Petroleum Institute (API), and European Standards. TAL Holland BV is one of Europe’s largest stockholders of West-European and Japanese X65 seamless and welded pipes. The company provides a size range between 2in and 36in, and pipes are impact-tested at -50°C. TAL Holland BV’s professionally trained sales team is on hand to satisfy client requirements regarding stock or customised materials. Certified and approved manufacturers supply high-quality materials that can be collected directly from the company’s warehouse or shipped worldwide, depending on the client’s needs. TAL Holland BV’s account-oriented approach guarantees that its dedicated sales staff are always up to date with requirements and preferences, and can effectively act to the needs of the customer. Orders are handled by the company’s experienced logistics and quality control personnel to assure a smooth flow of orders up to final delivery of materials and documentation. TAL Holland BV’s project team assists engineering companies, contractors and end-users requiring support in sourcing, supply and logistic control of complete piping packages. As well as its knowledge base and inventory of standard and project-dedicated stock, TAL Holland BV also accommodates clients’ just-in-time / call-off routines, allowing them to run efficient site-warehousing. The financial structure and reputation of the TAL Group and its extensive manufacturer network guarantee a timely and uninterrupted supply for every project. Experienced expediters ensure everything is done to keep the manufacturing and supply schedule in line with project planning. 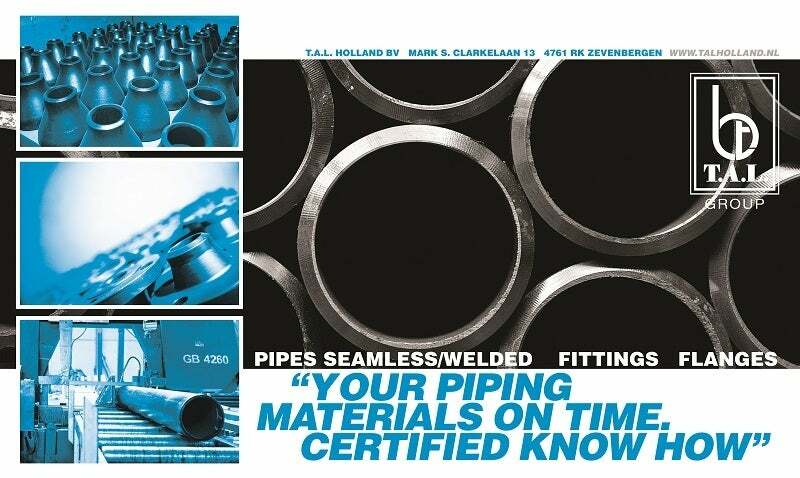 TAL Holland BV has a quality system in accordance to the requirements of Det Norsk Veritas (DNV) EN ISO 9001: 2008 for stockholding and sale of pipes, fittings and flanges. The company’s staff has a long experience with all material standards, such as ASTM, API and European Standards. Founded in 1999, TAL Holland BV is part of Italy’s TAL Group. For more than 35 years, the company has been one of the leading steel pipe distributors in Europe, with a continuous average stock of 65,000t in more than 200,000m² of storage area. It distributes thousands of items to more than 2,000 clients, ensuring prompt availability. The international expansion of the group is the result of a marketing strategy, leading to the opening of TAL Holland BV in 1999 and a new sales office in Singapore in 2011. With more than 35 years of experience and one of the biggest stocks in Europe, TAL is a distributor recognised worldwide. Tubi Acciaio Lombarda (TAL) Holland BV provides an extensive range of pipes, fittings and flanges to suit the needs of industrial applications.